Particularly suited to narrower WHITING® roll-up door models, such as DryFREIGHT™, Aluminum Clad, Laminated Premium, Q-Plate and Premium Plate. A good all-rounder for increased security, reduced cargo damage, and enhanced aesthetics. Ideal for narrow doors, this essential part keeps your roll-up door closed in transit, and ensures that cargo is safe from loss, debris, and damage from the elements. In addition, the Recessed Cam Lock helps protect your roll-up door from damage by keeping parts secure during transit, thus reducing maintenance and downtime. Being recessed into the door, there are no parts exposed to the elements which results in less wear and maintenance, as well as providing a clean, professional look to your roll-up door. The unique design makes the Recessed Cam Lock easy to operate with just one hand, increasing staff efficiency. 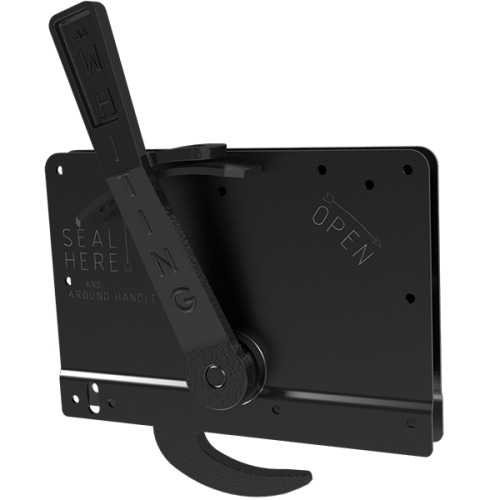 With this lock, pad-locking capabilities are built-in, providing increased security and removing the need for a separate keeper. The E-coated finish provides increased corrosion protection for reduced maintenance. The combination of increased security, reduced maintenance, and enhanced door aesthetics make this cam lock a cost-effective addition to your roll-up door.